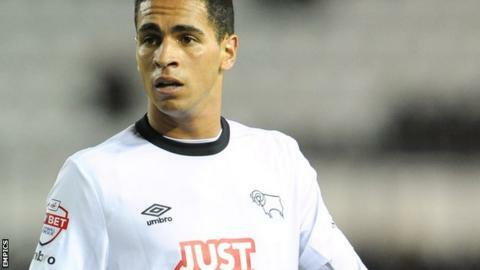 On-loan Read Madrid midfielder Omar Mascarell says Derby County supporters have helped dismiss his misgivings about English football. The 21-year-old Spaniard has played 12 times since moving to the Championship club from the La Liga giants. "In my first game here I had doubts about my football and if it would be liked," he told BBC Radio Derby through team-mate and interpreter Ivan Calero. Spain youth international Mascarell, who made his solitary first-team appearance for Real Madrid as a substitute for Mesut Ozil in 2012-13, admitted the physicality of England's second-tier competition has taken some getting used to. "There are many differences between Spanish and English football," he said. "Here in England the football is quicker and stronger, while in Spain it is more controlled. "I'm happy to learn about the football here and it will be good for me."